This pattern looked familiar, but the words Hansall Monday were not! The pattern is the same as Christmas Day which I posted recently. 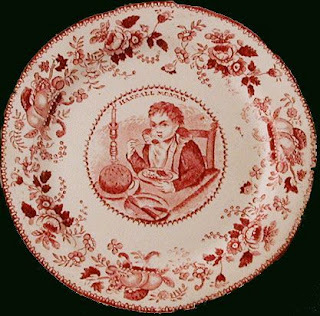 The border, of course, is different, but the child is the same boy eating his Christmas pudding. I hadn't a clue about Hansall Monday, but Louise Scriven gave me both the image and the information. Handsel or Hansall Monday (there are lots of different spellings) is the first Monday after the 12th of January. It is a holiday that used to be celebrated in Scotland and Northern England. The handsel refers to small tips and gifts of money that were customary to give at the beginning of the first working week of a new year. In this respect, it is somewhat similar to Boxing Day (December 26) in England and Wales. Handsel is an old Scottish festival. 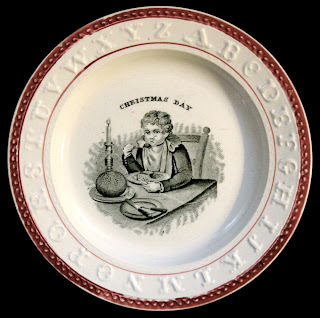 Before the nineteenth century, it was the main midwinter celebration as Christmas was considered by Calvinists to be heathen and Hogmanay hadn’t come into fashion. Handsel was a day for giving presents, and that is where the name comes from. Handsel (or hansel or even handsell) is a Middle English word for luck or a good omen that comes from Old Norse (from handsal which means giving of the hand to seal a promise, similar to a handshake today). It became the name for a gift given on any special occasion, such as taking on a new job, beginning some enterprise, or beginning the New Year. It makes sense that this plate was made for the Scottish market with the same pattern as Christmas Day, as Hansall was the more important holiday in Scotland in the early 19th century. It was more important than celebrating Christmas or the New Year. My mum used to insist on 'hanselling' any new wallet, purse or handbag with some coins as a king of good luck blessing thing. That was in Ireland, she pronounced it 'hanshel'. Now I do it too for my sons. How interesting! Thank you and Happy New Year! Thanks Judie, something new to learn! Your blogs are always so interesting. Thanks Loren! I never heard of Hansall Monday before either. I keep learning from transferware patterns. They open a window onto history.